Indian PC Sales Register Record Growth, Thanks To Uttar Pradesh Notebook Deal! Worldwide, PC sales have been showing sluggish growth. With advent of Tablets and smartphones, lesser people are buying notebooks and Computers. However, according to IDC’s 2nd quarter report on PC sales in India shows a record 24 percent growth Year on Year and even better 30.2 percent growth compared to previous quarter. However, this record growth could be treated as an aberration because it has come on the back of various special projects that were announced by states like Uttar Pradesh, Rajasthan and Tamil Nadu. These projects itself accounted for one-third of total PC market size in Q2 2013. Out side of these state funded special projects, the situation of weak organic demand for PCs remain, something that will surely be a huge concern for PC vendors in India. In terms of Vendor share, HP recorded highest ever quarterly market share, capturing 34.1 percent of the total market. But again, this was due to one single largest notebook deal struck by state of Uttar Pradesh as part of their scheme of handing free notebooks to students. 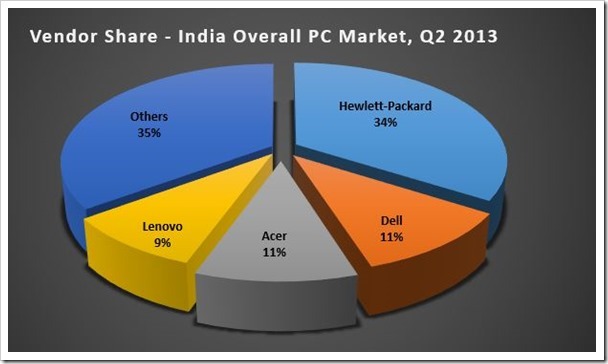 Dell had the second highest market share in India with 11 percent followed by Acer who captured 10.4 percent of Indian market share. Though prior this 2nd quarter, the growth of PCs have been sluggish, IDC analysts expect the growth to pick up in third quarter, which historically has been the best quarter for PC vendors. Months of July, August and September normally coincide with school and colleges starting and also coincides with Indian festival season during which the sales of laptops and computers are at peak. According to IDC’s research manager, Kiran Kumar – “July remained upbeat and we are noticing the growth to continue into August too. Consumer sentiments have peaked in at the right time as they begin to reconcile with the market reality on inflation and related pressures. Retail walk-ins have improved and share of consumer wallet looks to move back to PCs, which is an encouraging sign for the consumer PC vendors”. Moserbaer Launches Boxofficeboss.in To Sell Movie DVDs & CDs. Is There A Market For It Anymore?